Saturday- We did some tasks around the MH, then went to Cafe Zupas for lunch. We stopped at the library to pick up some DVD’s. We returned home and had a quiet evening watching Game of Thrones. Sunday- We did our usual laundry and bookkeeping. No Redskin game today. We went in In’N Out burger for lunch. We continued to watch Game of Thrones. Monday- Rosa the tropical storm is starting today, so we had a quiet day at home due to the rain. We watch TV and the video. Tuesday- Rosa is flooding the area. I had my mammogram scheduled for 9AM, so I had to drive in the flooding. The park had a lot of water and Union Hills also was flooded. I drove thru carefully, checking my breaks after running thru the water. The people around here do not know how to drive in rain. They must think its fun to speed and throw water everywhere, then spin out and land in a ditch! I crossed over the bridges and the rivers now had water in them. There is a story in Arizona about prisoners who escaped from prison. Their plan was to steal a boat and float down the river. Haha, they arrived to find that the river bed was dry. The only time it is filled with water is in the monsoon season. They eventually turned themselves back in. So this was one of the rare times that I saw water in the river beds. Once I turned off of Union Hills, the rest of the roads were clear. Once I turned onto Thunderbird, the traffic was very slow. One of the underpasses under the 101 was flooded, so people were on Thunderbird. I crossed over another bridge. I had to stop on the bridge, which gave me the opportunity to look down. There is a park in the river bed with a basketball court. The water was about 3/4 of the way up the pole to the bottom of the basket, and this was a wide river bed! I had my mammogram, and all was negative. I was much happier with Valley Radiology rather than Simon Med who I used last year. They were horrible! I dropped my mammogram film off at my doctors office and returned home. On the way into the park, I stopped at the mail room. It turned out, the Amazon delivery service had delivered my two boxes, with my bike baskets, to site 1700, on Sunday. They dropped off 15 boxes at that park model. The poor gal who lives there received her one box, and the other 14. So she had taken them to the mail room Monday afternoon. When I had not received my order on Sunday, Amazon refunded my payment and told me if they arrive, to not worry about it. So both of my baskets were free! We spent the rest of the day indoors, trying to stay dry. Bob would watch the radar and whenever he saw the rain let up he would quickly walk the dogs. Wednesday- Happy birthday to Bob! The world was starting to dry out! I went to Mahjongg with MaryAnn and a new gal Connie. Sharon dropped by and said she could play tomorrow. I returned and we had a quiet afternoon. We went to Denny’s for Bob to have his free Grand Slam for dinner. Bob went to the West Valley Astronomy Club meeting. Thursday- I went this morning to play Maj. Bob went to the storage unit and brought back some items. We have received new bike seat covers. Bob had put on my bike baskets. We had a quiet afternoon. 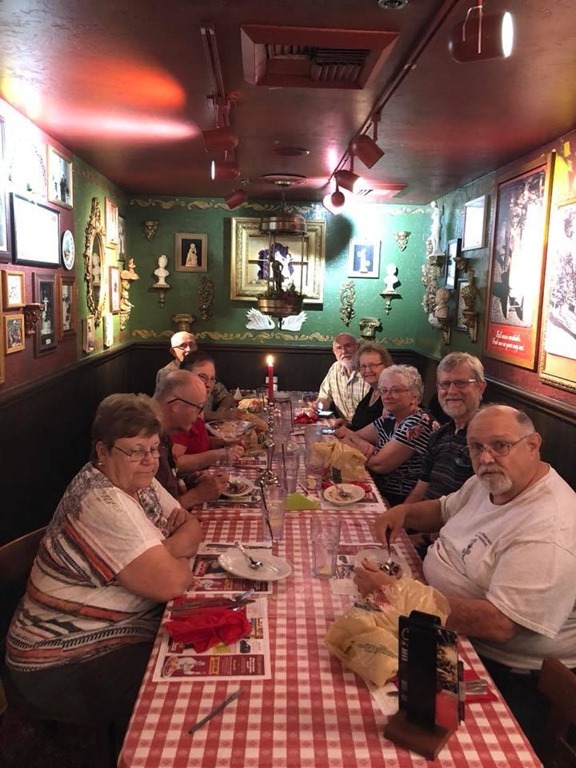 In the evening, we picked up Linda and Mike and went to Bucca de Beppo for dinner. We met up with Karen/John, Allen/Donna, Ray/MaryAnn. So since there were 10 of us, they put us in one of the “Pope” rooms. This was a rectangular room and the Pope statue was in a cubby, not on the table, like in the Pope room that is circular. We had a great time. 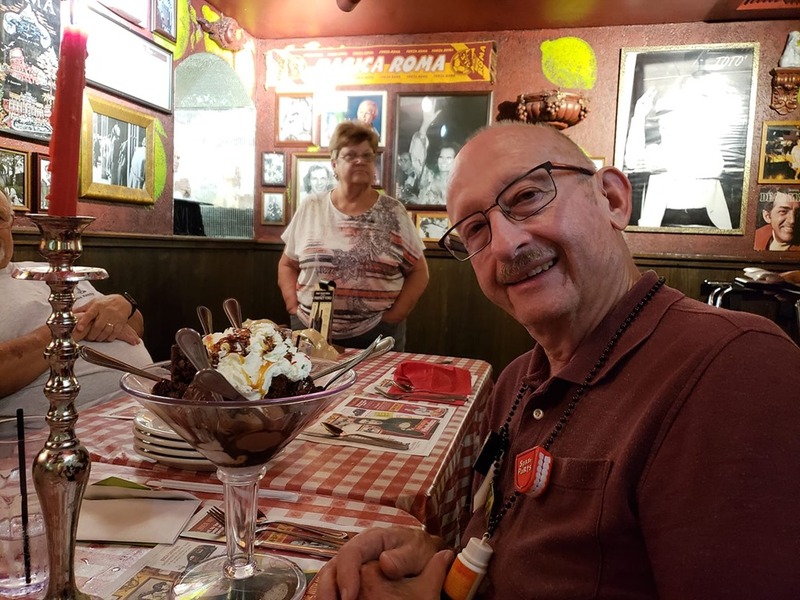 Here is the picture of Bob when he received his, to be shared, ice cream! Friday- We worked around the MH in the morning. I met friend Annette for lunch at Cafe Zupas. We had a great time catching up. We ate left over lasagna for dinner!